That is the economic value predicted to be generated by IoT by 2025. Wow, that is a huge number! To put this number in perspective, it is greater than the GDP of the US …and is 25% of the current GDP of the entire world. And here is where we think it gets even more interesting…. Sounds wonderful, right? But how easy will it be for businesses to tap into that value? Most organizations are just beginning to look at where to start their journey to capture their fair share of the $8T in potential value through IoT and Advanced Analytics. It’s a new technology paradigm, and can be a little daunting at first blush. Companies have invested countless millions in enterprise technologies to better run their business over the last few decades, and developed IT processes and methodologies optimized to manage scope, schedule, budget and quality for big bang solutions. Most IT organizations are having a hard enough building the technical capabilities through training or hiring to work with these new breed technologies. Few, if any, have had time to make the necessary corresponding changes in project governance and approach to capitalize the rapid value life cycle possible in this brave new era. 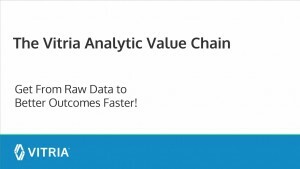 Vitria’s Analytic Value Chain provides organizations with a methodical, practical approach to leverage IoT data and advanced analytics to deliver business value in an iterative, incremental fashion — unlike traditional enterprise methodologies. Contextual Awareness – This data is then correlated with contextual and historical data to provide a baseline for advanced analytics. This might include master data, historical sales information, asset service history, etc. Situational Intelligence – The next stage of refinement and increased value includes information about the current situation such as weather, traffic, customer location or journey path, social sentiment and more. Predictive Analytics – The next step is to sense patterns and predict anomalies using continuous predictive analytics based on data science models built with historical and situational data. Prescriptive Analytics – Once the predictions are made, rules based on machine learning and best practices prescribe a course of action to capitalize on opportunities and address threats. Intelligent Actions – execute the real-time action to capture value. Preventing failures in real time and one-to-one marketing in real time are now possible.